For many reasons, you are considering to obtain mobile presence in your business where you need to choose between mobile website or mobile apps or maybe both methods. Mobile websites and applications may appear to be similar but in establishing one approach that will be most beneficial for your business depend on several aspects like budget, target market, needed features and functions, and uses. Mobile website contains the basic characteristics of being a browser-based HTML pages that are connected via internet. It is created for smaller display and touch screen interface. Similar to any ordinary website, mobile website can show information, pictures and images, text, videos, and they have the capability to access specific mobile features like “click-to-call” or dialing a phone number or through location-based mapping. On the other hand, mobile apps are real applications that are installed on your mobile gadgets instead of using the browser. Users can go to mobile phone’s sites like AndroidMarket, Apple’s App Store, and BlackBerry App World to look for the best mobile apps you need. These applications have the ability to get data and content from the internet and download them for easy access even without an internet connection. In making decisions and choosing the right options for your business will always depend on your business goals. If you are creating an interactive gaming, then selecting mobile apps is ideal. When you are into offering content to larger audience, then you may need a mobile website. There may be some instances that you see the benefits of choosing both. However, it is safer to create a mobile app without mobile website. For personal use which brings out the question: Are your target audience are those who will be using apps for their personal purposes regularly? Mobile apps solution is great for this cluster. Mobile apps are ideal for those who really love interactive games. Apps are best for multiple calculations and making reports as they have the features that allow your users to take information and manipulate this data with charts, calculations, or reports – like banking and investment. 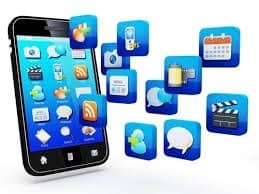 App is good choice for instances when there is a need to access to some data or do some operations without network or wireless connection. Although you may have gone through thorough research about the right options for your company and business, you still may be some concerns. You may contact our experienced and friendly mobile app development team to discuss the needs and requirements for your business and company. Click here to contact our team of mobile apps developers. Ways to Know if your Smartphone is Hacked!